At Infosat, technology is more than just a means to serve our customers and earn a living. It is one of our strongest passions. We get genuinely excited about discovering and testing the latest breakthrough products. We love to dream about new possibilities and then do the hard work to make them a reality. It’s a passion that we’re eager to share and encourage in others. This is why Infosat is the Titanium Sponsor of SWAT Bots, a team of fervent Airdrie high school students that designs and builds robots for competitive battles. 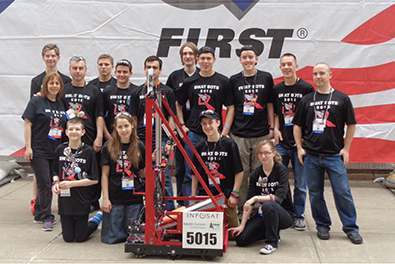 Since the SWAT Bots formed in 2011, the team has competed in numerous regional events and won a series of awards. The SWAT Bots’ strong performance has led to invitations to three world championship tournaments that are held each year in St. Louis. We are proud of all of the SWAT Bots and hope that each of team members will be inspired in technological pursuits. Find out more about the SWAT Bots. The SWAT Bots are Team #5015 in events staged by FIRST (For Inspiration and Recognition of Science and Technology).